Note: A line in a genotype, such as A_, indicates that any allele is possible. ten symbolized by one or more letters and a plus sign (+). The letter(s) chosen are usually based on the phenotype of the mutant. The first letter is lowercase if the mutant phe-notype is recessive, uppercase if the mutant phenotype is dominant. For example, the recessive allele for yellow eyes in the Oriental fruit fly is represented by ye, whereas the allele for wild-type eye color is represented by ye+. At times, the letters for the wild-type allele are dropped and the allele is represented simply by a plus sign. Superscripts and subscripts are sometimes added to distinguish between genes: Lfr1 and Lfr2 represent dominant alleles at different loci that produce lacerate leaf margins in opium poppies; EjR represents an allele in goats that restricts the length of the ears. A slash may be used to distinguish alleles present in an individual genotype. The genotype of a goat that is heterozygous for restricted ears might be written Ej+/ElR or simply +/ElR. If genotypes at more than one locus are presented together, a space may separate them. A goat heterozygous for a pair of alleles that produce restricted ears and heterozygous for another pair of alleles that produce goiter can be designated by E1+/EP G/g. Now that we have had some experience with genetic crosses, let's review the ratios that appear in the progeny of simple crosses, in which a single locus is under consideration. Understanding these ratios and the parental genotypes that produce them will allow you to work simple genetic crosses quickly, without resorting to the Punnett square. Later, we will use these ratios to work more complicated crosses entailing several loci. There are only four phenotypic ratios to understand (Table 3.2). The 3:1 ratio arises in a simple genetic cross when both of the parents are heterozygous for a dominant trait (Aa X Aa). The second phenotypic ratio is the 1:2:1 ratio, which arises in the progeny of crosses between two parents heterozygous for a character that exhibits incom plete dominance (Aa X Aa). The third phenotypic ratio is the 1:1 ratio, which results from the mating of a homozygous parent and a heterozygous parent. If the character exhibits dominance, the homozygous parent in this cross must carry two recessive alleles (Aa X aa) to obtain a 1:1 ratio, because a cross between a homozygous dominant parent and a heterozygous parent (AA X Aa) produces only offspring displaying the dominant trait. For a character with incomplete dominance, a 1:1 ratio results from a cross between the heterozygote and either homozygote (Aa X aa or Aa X AA). The fourth phenotypic ratio is not really a ratio — all the offspring have the same phenotype. Several combinations of parents can produce this outcome (Table 3.2). A cross between any two homozygous parents—either between two of the same homozygotes (AA X AA and aa X aa) or between two different homozygotes (AA X aa) — produces progeny all having the same phenotype. 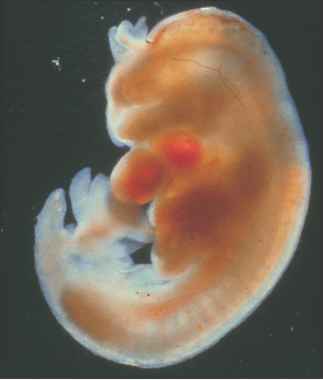 Progeny of a single phenotype can also result from a cross between a homozygous dominant parent and a heterozygote (AA X Aa).